These training shoes are made especially for Zumba, dancing and other aerobic exercising, so it is no surprise that they encompass all the features which we are looking for in shoes suitable for Zumba. They feature a Z-compress shock absorption and energy return system to decrease the force of impact when jumping and stepping and for restoring the original form of the shoe after that. Also, there is a Z-brace system for keeping the feet safe and secure in place, which is crucial especially for high-energy Zumba and dancers. The other unique feature is the Z-slide system which enhances easy sliding on every type of surface, and won’t stick on those wooden floors in the studio. The cushioning and fit is actually quite amazing, and combined with their lightness will leave you with the feeling of stepping on pillows or feathers. The support and energy-return is also crucial to keep your feet, ankles and legs safe from twisting as well as prevent the soreness in the knees and other joints after an intensive Zumba class. 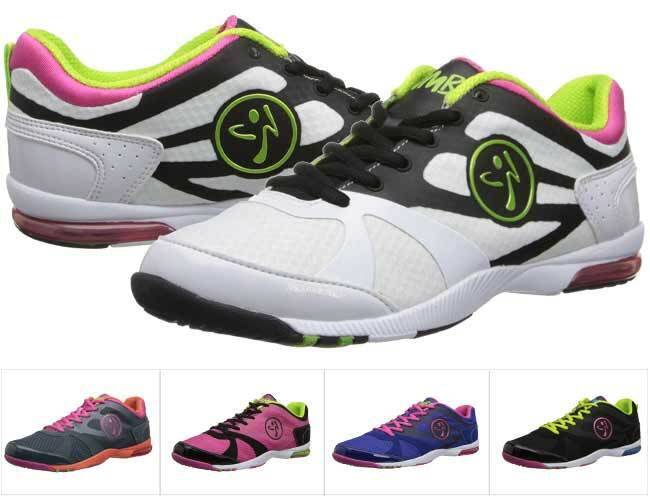 The light weight, nice support, energy return, the easy sliding and the overall comfort provided by these training shoes will allow you to enjoy your Zumba classes more, improve your performance and reduce the intensity of training without suffering soreness in the feet and leg joints during or after class. They are true to street size, so no need to order a larger or smaller size. Overall, these training shoes are pretty, colorful, comfortable, slide well, provide support, cushioning and shock absorption for safe and painless leaping and jumping. Also, their wraps on the outsole provide a very smooth heel-to-toe transition when moving side to side, so overall we must conclude that they are perfect sneakers for Zumba. Need something just a bit different? Check the Influnce by Ryka.